You probably haven't heard of Ralph's Mountain. I don't recall how I did. It's a dumb name for a mountain. Although it doesn't appear on most maps or in the USGS database, it sometimes shows up on MROSD maps, and there's a single report of someone hiking up the thing. Inspired largely by the hiking report, I decided to check it out, as an alternative to Black Friday nonsense. Getting to the top of Ralph's Mountain would be an accomplishment by itself, but I had ulterior motives. Satellite images of Ralph's Mountain show an intriguing little scratch of a trail heading up a ridge, and nearly meeting the Thayer/Umunhum ridge. So I held out some slim hope that this could be a backdoor to that area. You may notice that the title of this post is not, in fact, Ralph's Mountain. That's kind of a giveaway, but more on that later. To get to the trail, you have to get to Summit Road. For me, that's a good two-hours of riding (with 1300 feet of climbing), but the reward is lunch on the patio of the Summit Store. If you're riding around the Summit area, you should contrive lunch at the Summit Store. Today was a little cold, so I had a freshly made sandwich and a big coffee. From there it was off to the base of Ralph's Mountain, which turns out to be the site of a former town called Wrights Station. Before heading down the valley, I could see my target -- the switchbacks heading up to the top. Didn't look too scary from here. It also didn't look like a distinct, name-worthy mountain, which the hiking report pointed out. To get to the trail, you take Morrill Road down to Wrights Station Road, and follow that down to the creek, a 700 foot drop. Avoiding that climb, even at an easier grade, was what made the tunnel worthwhile in the first place. I would have preferred to avoid it too, and could have, since the traditional road (and train line) from Wrights Station just follows the gentle grade of the creek. But that road is blocked by the water company, for reasons that completely escape me. 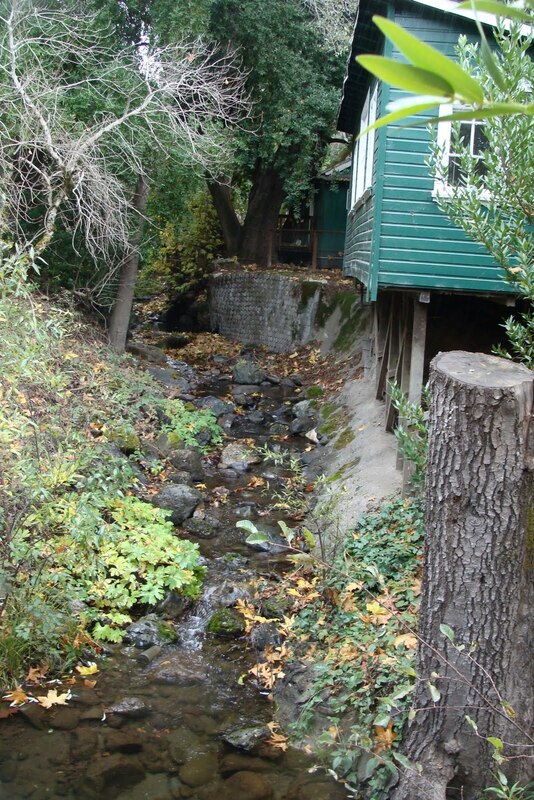 I can understand why they feel they have to own the land around Los Gatos Creek, I suppose. I just can't see why they have to prevent access to it. I suppose I'm poorly disposed toward the San Jose Water Company. First of all, I pay them a bunch of money every month, and while I'm not philosophically opposed to that, it's a not a healthy basis for a relationship. Also, when I first tried to ride from my house to Santa Cruz, I naively tried to follow Aldercroft Heights Road, which they've also blocked. In fact, it's the road that would connect to Wrights Station. I had to turn around, too tired to try the proper route up Old Santa Cruz highway. And now they've forced me to climb to Summit Road unnecessarily. If my personal inconvenience isn't enough pathos for you, the company's acquisition of this land has an ugly history. On the way down to Wrights Station, I had two thoughts running through my mind. First, that my brakes were nearly shot. And second, that I'd hate to have to climb this road. 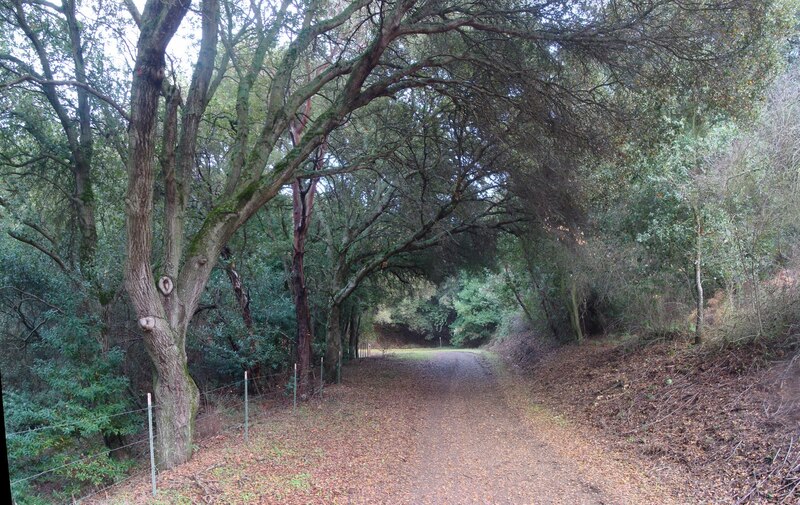 Wrights Station Road eventually comes to a bridge over Los Gatos Creek. This is where the town was. It used to look like this; it's now entirely overgrown. The historical photo shows the bridge and the tunnel in the background. We're looking south, from a little way up the side of Ralph's Mountain. That particular angle wouldn't be possible today, since the hill is entirely overgrown. The tunnel opening still exists, but apparently the tunnel itself was, as they say, closed with explosives a hundred feet in. I didn't check. On the right side of this photo, where the buildings on the right side of the old photo stood, is a 20 foot deep gulch. The big white building on the left side of the old photo is now a little clearing for parking. It's on my left and across the road as I take this photo. This is another old shot of Wrights Station, taken from the road, facing north toward the creek. It shows bustle. 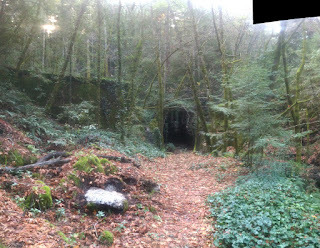 The tunnel was built in about 3 years starting in 1877. During the construction, saloons popped up to serve the workers, and the area earned a rowdy reputation. Once the tunnel was complete, Wrights Station became a shipping point for the farmers along Summit Road and up the Los Gatos Creek valley, shipping fruit to San Jose. Eventually the highway killed the train, which stopped running in 1940. 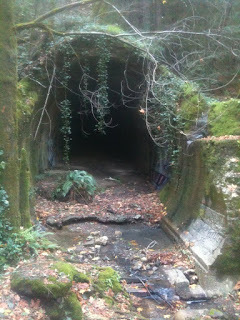 The water company bought the area, knocked down all the buildings and pulled up the tracks, and the Army blew the tunnel in 1942. There's still a bridge, and it's a pretty one, but the railings don't match the historical photo. The position matches. When I was there I didn't know that there had been a railroad trestle just downriver, so I didn't look for it. This photo was shot upriver. Across the river, you can see the road that links up with Aldercroft Heights Road, conveniently gated. Jerks. Turning right after crossing the bridge, I headed east along the river, on something called Cathermola Road (there are variant spellings). I passed by a turn-off up the hill, obviously not remembering the hiker's report very well. But that's all for the best, because this area is a very pretty part of the world, and a pleasant place to pedal through. Like all paths in this area, this one ends with two gates: one heading to a house, the other barring access further up Cathermola Road, which protects people from enjoying the Lake Elsman reservoir. 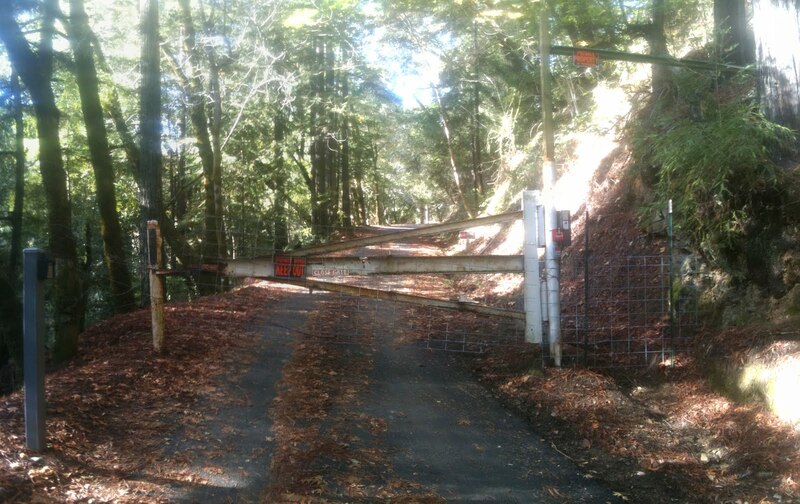 It's clear they would have gated the road even closer to the bridge if they didn't have to allow access to the house. Jerks. Now I knew that the passed-by turn-off was the way to go, so I headed up there. 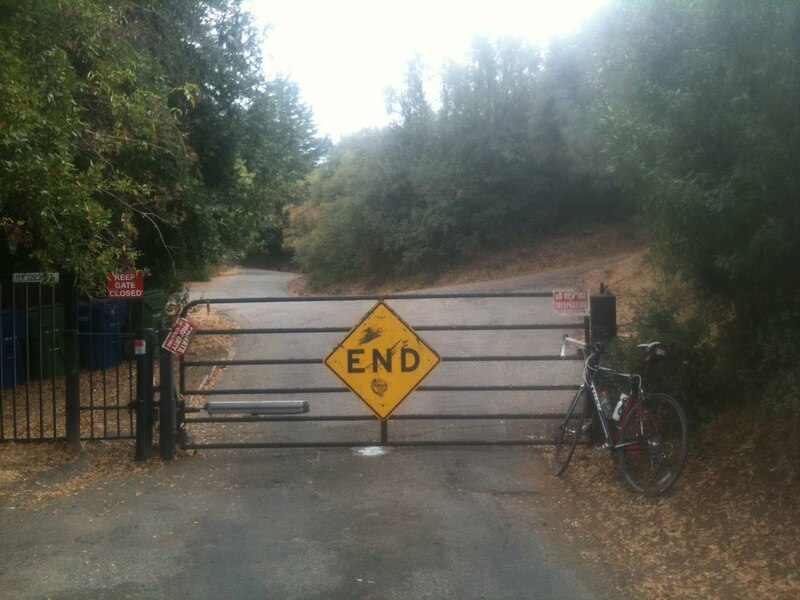 I almost immediately found a gate. A pretty formidable gate. It's enough to give a guy a complex, make him feel unwelcome. At this point, I didn't know whether there was a house up there, and thought there might be another turn-off I'd missed. So I didn't mind too much when I turned around. I quickly realized that I hadn't missed anything, and that I'd have to climb back up Wrights Station Road. There's something particularly galling about backtracking up a hill like that. According to the topological maps it's much less steep than the trail I wanted to ride, but it felt steeper. Steepness borne of bitterness. The damned water company made me climb Summit Road twice. Jerks. There's definitely a house at the top of the gated turn-off, but it's far beyond where I would have left the road. There's another set of buildings closer in, and they are probably houses, but this map seems to indicate that the road would run through only institutional land. It's tempting. I really want to conquer Ralph's. Once back on Summit Road it was mostly downhill going home, so I bundled up and wore out the remainder of my brake pads. The ride was more than 40 miles, and the Garmin showed some 3500 feet of climbing, which again is overestimated -- I'd make it closer to 2400 feet. I didn't do what I had hoped to do, but I had spent some time on the bike, had seen something new, and had a lovely sandwich. Better than searching for parking at the mall. 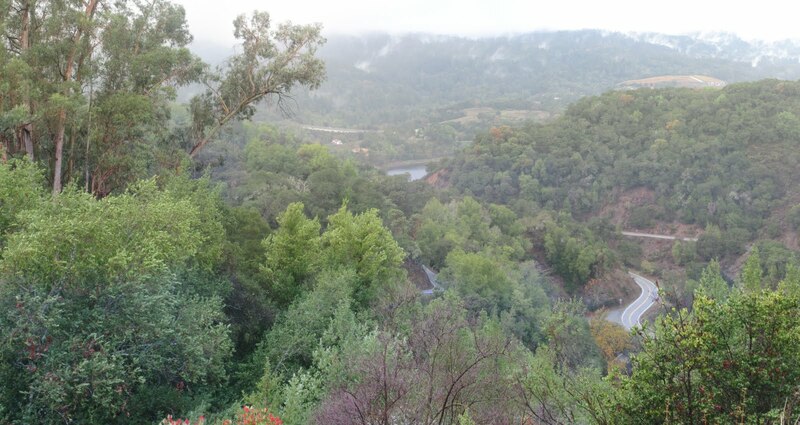 When I rode from Loma Prieta to Umunhum, I went by a trail that runs from that high ridge right down to Alamitos Road. I'm pretty sure I once saw that trail from a plane, too. And it shows up on most maps, but it always ends just shy of Alamitos Road. Does it really go through? I looked around for descriptions of the trail, but it's a hard thing to search for. 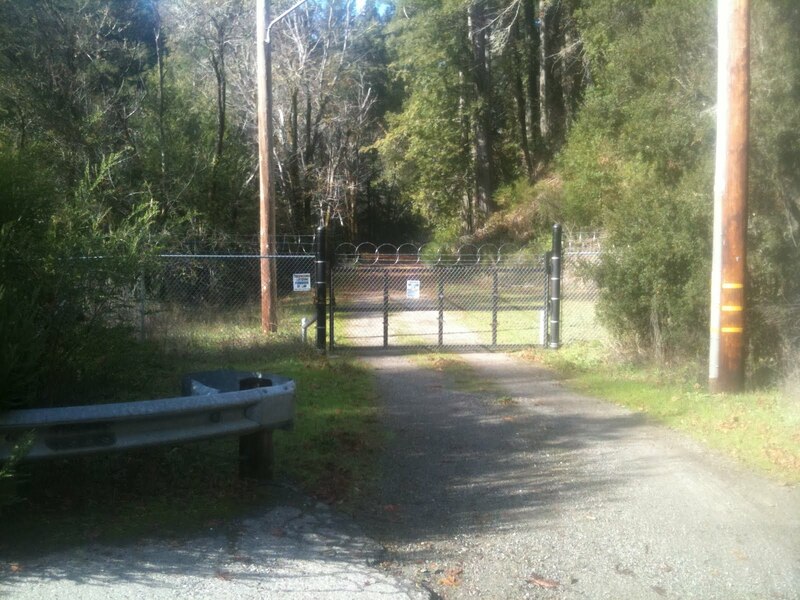 Along the way, I came across a map that showed that the MROSD had purchased an old house on Herbert Creek. The map showed a road along the creek, heading toward Alamitos Road. The purchase happened just a few years ago, so there must be a trail through that area. I had never been to the southern end of Alamitos Road, and now I had two things to investigate. So on this Thanksgiving morning I bundled up (the thermometer read 30 degrees when I left) and headed south. 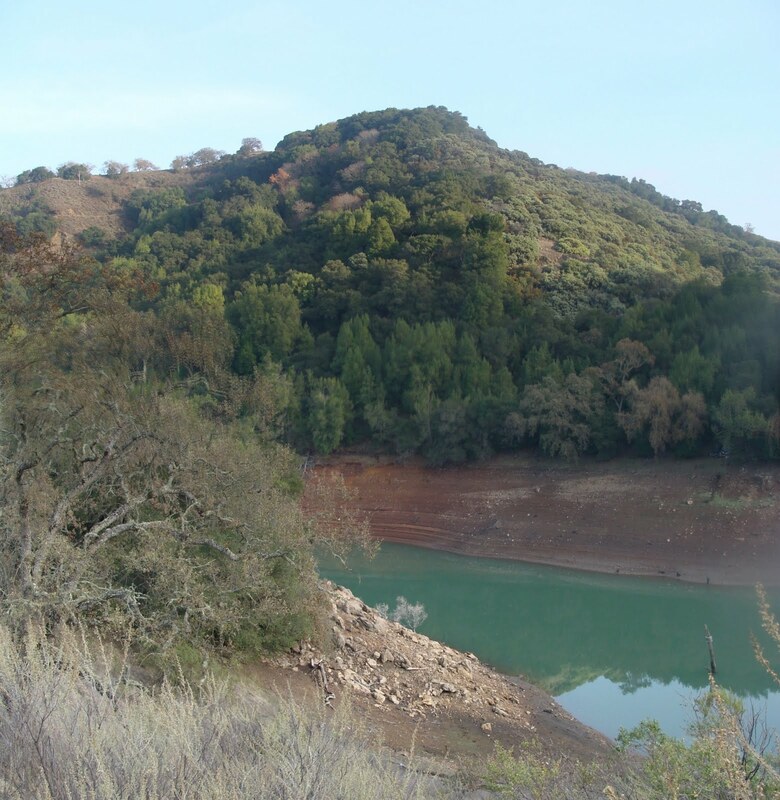 I rode past Almaden Quicksilver park, past the really-low Almaden Reservoir, and past Hicks. And at that point, I was in new territory. Alamitos Road ends in a little community called Twin Creeks, a collection of small cabins of identical design and color, arranged in cozy clusters. It has the appearance of an old resort, and sure enough that's exactly what it was in the 1920s. These days the cabins look their age, and by all appearances are permanently occupied. 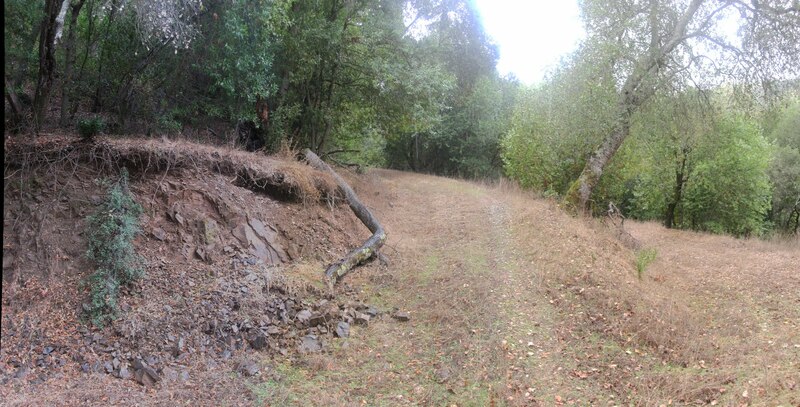 Very near the entrance of Twin Creeks is where the Loma Prieta trail is supposed to emerge. 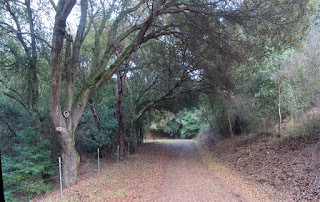 There are a pair of private paths that head south off of Alamitos Road, past a set of cabins, and off to picnic or sports areas, I think. There were no fences in sight. I'm reasonably sure that one or both of the paths link up with the trail. But to verify that, I'd have to poke around too close to people's houses, and I wasn't going to do that. 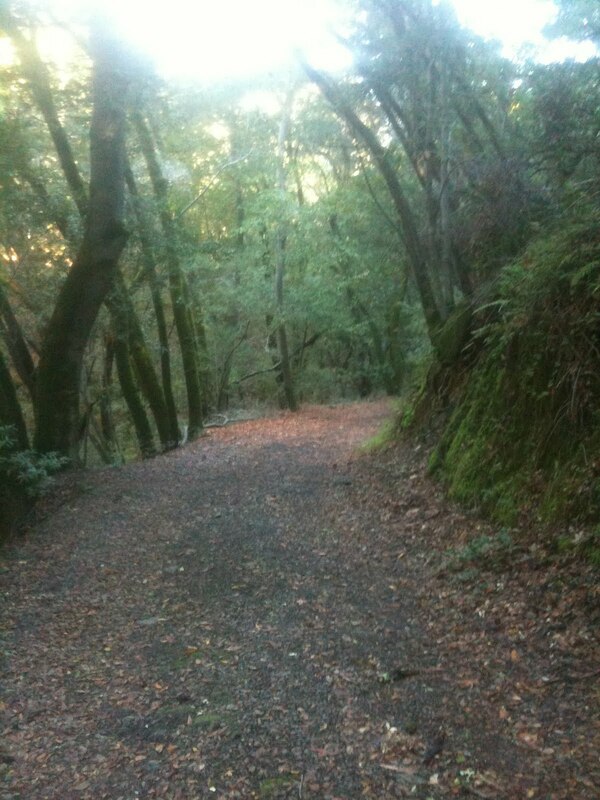 I wouldn't mind riding past if I was coming down the trail, but nosing around would be creepy. Nonetheless, one question more-or-less answered. 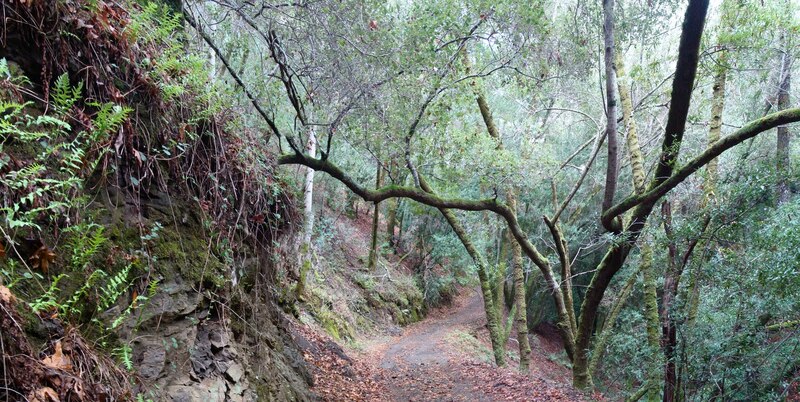 I'm sure one could ride down the Loma Prieta trail and get to Alamitos Road. Continuing on Alamitos Road, now heading west, I passed more cabins as the road narrowed from a skinny two lanes to an unapologetic single lane. Twin Creeks is generally wooded, and by the time the road narrows and starts to climb the valley a bit, it's fully enclosed in woods. The road turns southwest to follow Herbert Creek, and is paved until shortly after it passes over a bridge. The woods here are gorgeous, with the lovely little stream and bright green moss growing on the trees. On all sides of the trees, I might add. It was perfectly quiet. The morning was still cold and there was certainly no sun to warm me up, but since I was climbing and didn't have to worry about wind, it was comfortable. 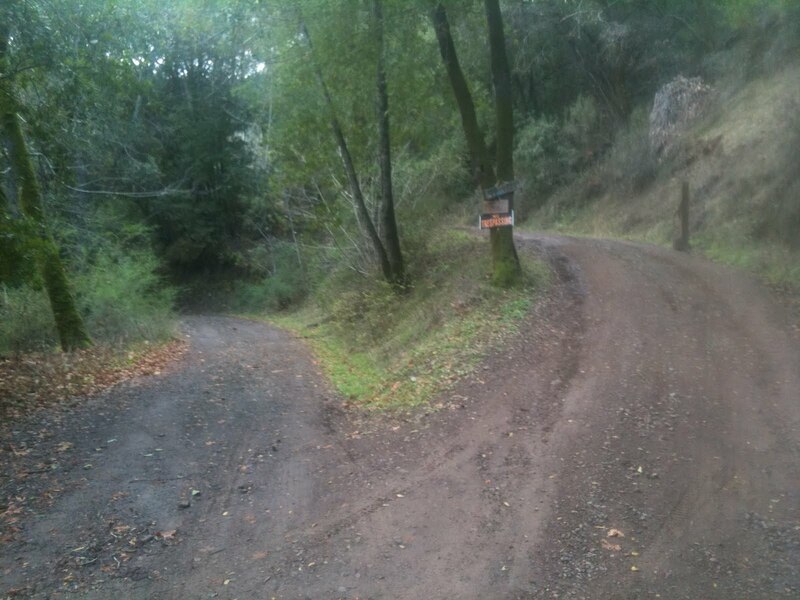 I came to a fork in the road, and chose the left fork, the low road. It was the wrong fork. This trail gradually turns south to follow some other creek. I went along this path for a while as it climbed the valley, until I came across a building in the distance. I didn't see anyone, but chickened out and turned around. 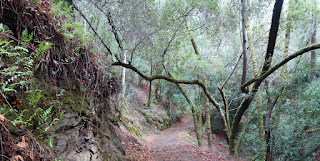 Had I followed the high road, I would have hugged Herbert Creek, and been mostly on MROSD land. I realized that as I passed by, but I needed to get back home for Thanksgiving, so exploring that path will have to wait for another day. The ride home was unremarkable except for the especially vivid shifts in environment. From a lush, wet forest to dry chaparral to suburban artifice, all within a few miles. Only about 20 miles today, with a maximum elevation of about 990 feet, at the turn-around point. Only a couple of the miles were at all new to me, but they pointed the way to a few new possibilities. A little satellite imagery can be a dangerous thing. On my Pheasant Road ride, I took a picture of the Hicks Creek valley and Reynolds Road. Looking at that area on the map, there's a branch of Reynolds Road that appears to head pretty far up the slope of El Sombroso. I wonder what's up there? Reynolds Road peels off of Hicks Road, and climbs about 700 feet in 1.5 miles. From its heights you can enjoy views of the dump, and if that's too distant, there are almost always abandoned mattresses and sofas and so forth along the road. 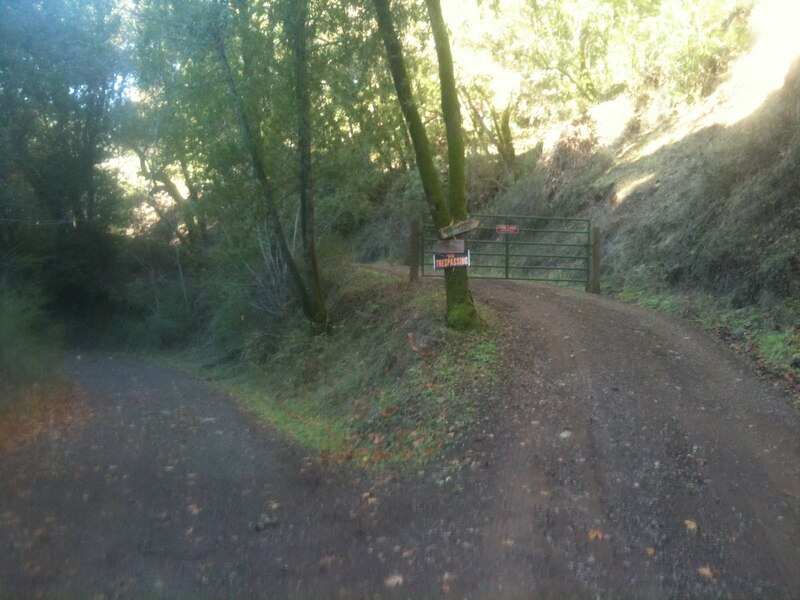 After 1.5 miles, it turns to dirt and climbs again to a fork in the road at about 1300 feet. On the left fork, you get a couple hundred yards before you get to a chain across the road. There's a sign that reads Sycamore Springs Ranch, which as far as I can tell has no presence on the web. I should point out that at the point at which the pavement turned to dirt, a sign told me that only authorized or resident vehicles were allowed any further. So to get here, I had already respectfully disobeyed a sign. Why not cross this easily-crossed gate? Well, I'll tell you. I'm willing to break the rules by riding onto closed open space (if you will), but I'm not willing to enter private property. I keep thinking that, if it were my place and my kids were playing outside, I'd be pretty creeped out by some stranger riding through. Having said that, I'm willing to enter private property if I stick to a road that I think is a thoroughfare (even if the law isn't on my side). I have little patience for privatized roads. So this could be that situation, but the satellite image makes the trail from this point look more like a driveway than a road. So having got to the end of the left fork, I turn around and start exploring the right. On the maps, it was clear that there weren't many houses up this way, and signs at the fork seem to indicate that there are exactly three. In this area you can look up the slope of El Sombroso, up the valley, and see a house perched somewhere up the ridge. From here it looks impossibly far up, but there must be a road to it, and this is really the only candidate. The right fork is lovely. Reynolds Road has trees, and trees are great, but what with the trash on the road and the scrub near the fork, it's not the prettiest area of these hills. The right fork heads through much deeper woods, past two of the three houses up here. 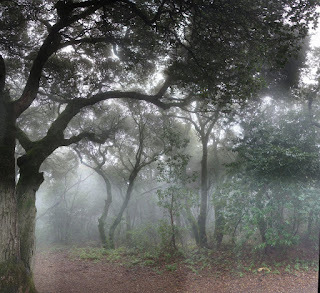 On the damp, windy day I was exploring, the woods were making constant noise. Acorns (I think) were making uncannily loud cracking noises as they fell and rolled down the hills. The trail here is wide enough for one vehicle, barely, and the leaves and grass on it didn't give the impression of heavy use. 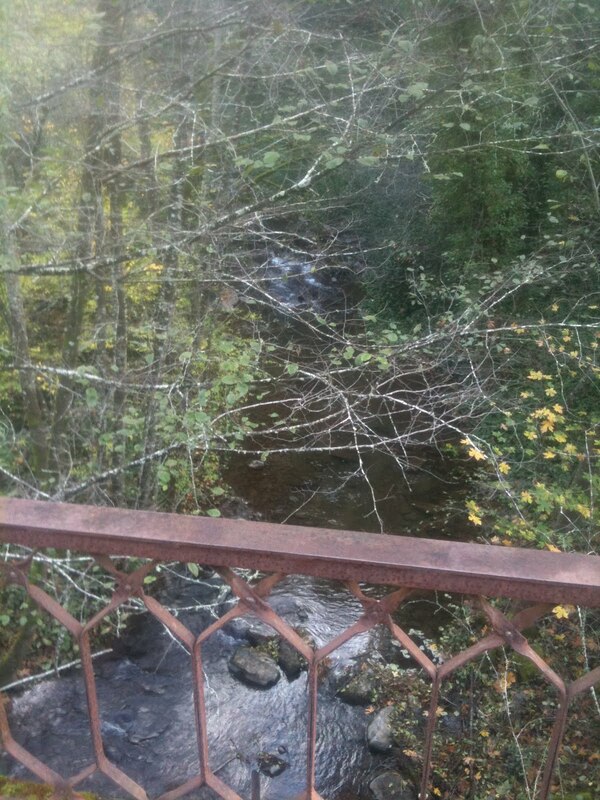 Eventually, one gets near that house I spied from the fork. I knew the road went right next to the house, and was getting anxious about riding under the noses of the occupants. I was spared that experience by another gate across the road, where the path turned north. It's about 1600 feet up the hill at this point. That's a real shame, because it looks like there's probably another mile of trail beyond the house. I'd love to go exploring those trails someday. On the way down I took a panorama shot of the Hicks Creek valley, showing the hill that the Pheasant Road trail winds around. In the valley you can just make out a little house. This house, according to logic and a little search engine detective work, is a former residence recently purchased by the MROSD, and is now serving as a caretaker's residence. The gated driveway very near the bottom of Reynolds Road is its entrance. 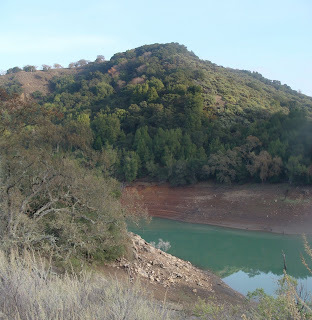 Another document on the the same site indicates that the MROSD recently bought the section of land at the far end of the left fork of Reynolds Road, past that Sycamore Springs Ranch house. That doesn't help me any; the only path is through that private property I'm not willing to cross. But the map in that document does indicate that the trail goes all the way up to that property, and maybe someday we'll be able to ride it. A good leisurely ride, and a little more of the "personally unknown" explored. About 12 miles, with 1800 feet of climbing.